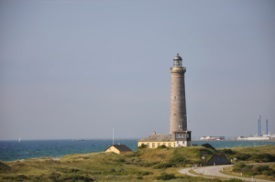 A painter once said of Skagen,"The real Denmark is a winter day at the North Sea with the wind blowing back your hair and making your skin salty, a trip in the autumn forest to gather mushrooms, or a romantic stroll in the newly leafed beech forest." This wild, romantic paradise at the tip of Denmark also contains a surprising sophistication, with many cafes and seaside shops attesting to the large population of artists who reside here. Hans Christian Anderson wrote here, and the Skagen Impressionists painted many works of art here that rival any of their French counterparts.